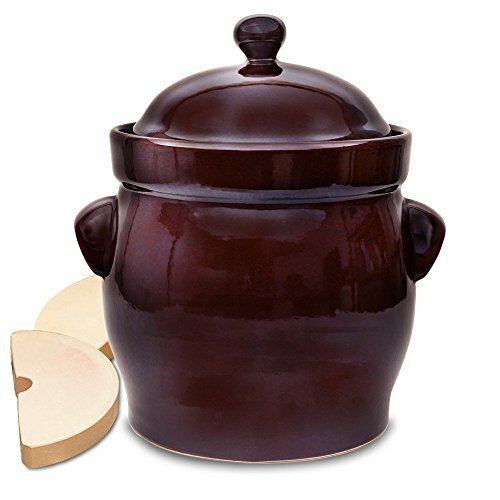 The TSM Products 10L Polish Fermentation Pot features heavy, earthenware construction and is beautifully crafted by skilled artisans. Created from local clay deposits in a region of Poland known for excellent ceramics, the pots are fired at temperatures over 2000 F, and feature a deep reddish brown, sienna glaze. Each pot is lead, Cadmium free and intended for long term food storage. Stone weights are included. Fermentation pots are used to keep vegetables under their fermenting liquid during fermentation and a unique water channel or gutter design, when filled with water, creates a perfect oxygen and mold free environment to promote lactic acid vegetable fermentation. Easily make healthy homemade, Probiotic vitamin enriched foods, full of nutrients and natural enzymes. Easily makes traditional sauerkraut, Kimchi, Kombucha and pickles. The TSM fermenting pot can also be used for brining olives and can be used to ferment beets, onions, beans, carrots, peppers plus more of favorite vegetables.